Bruschetta is a crunchy Italian appetizer that celebrates summertime tomatoes, fresh basil, garlic and olive oil, all of which is spooned over crispy, toasted bread. With all of that goodness packed into one bite, it’s no wonder it’s so popular! While tomatoes are lovely, the concept of bruschetta is open to interpretation. Instead of the standard tomatoes, we put some of summer’s best stone fruit in the spotlight, creating three scrumptious, tomato-free bruschetta using peaches, cherries and apricots. Enjoy one, two or all three of these sweet-meets-savoury creations for a bright, stunningly beautiful alternative to typical tomatoes. Thinly slice 2 ripe peaches and place in a medium bowl with 2 thinly sliced radishes, 1 Tbsp thinly sliced green onion and 2 Tbsp fresh cilantro leaves. Toss in 1 Tbsp olive oil and 2 Tbsp fresh lime juice. Season with salt and pepper, to taste. Mix and let peach mixture stand for 10 minutes. 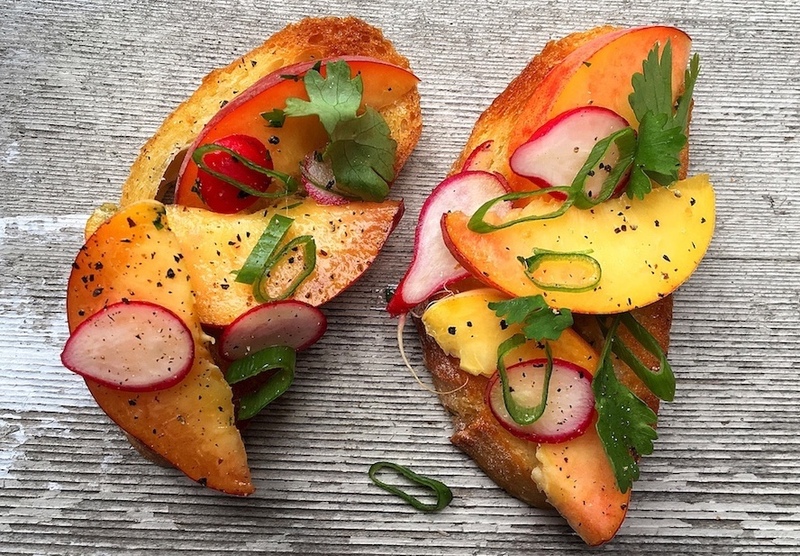 Garnish toasted crostini with peach mixture and serve immediately. Makes 8 to 10. Pit and slice 2 cups cherries and place in a medium bowl with 1/4 cup minced fresh chives, 1 Tbsp balsamic vinegar and 1 Tbsp olive oil. Season with salt and pepper, to taste. Mix and let cherry mixture stand for 10 minutes. Smear extra-smooth ricotta on toasted crostini and top with cherry mixture, spooning over residual cherry juices. Serve immediately. Makes 8 to 10. Slice 2 cups ripe apricots and place in a medium bowl with 1/4 cup sliced red onion and 1/4 cup finely chopped basil. In a small bowl whisk 1 Tbsp white wine vinegar with 2 Tbsp apricot jam and microwave for 30 seconds. Toss apricot mixture with jam mixture and let stand for 10 minutes. 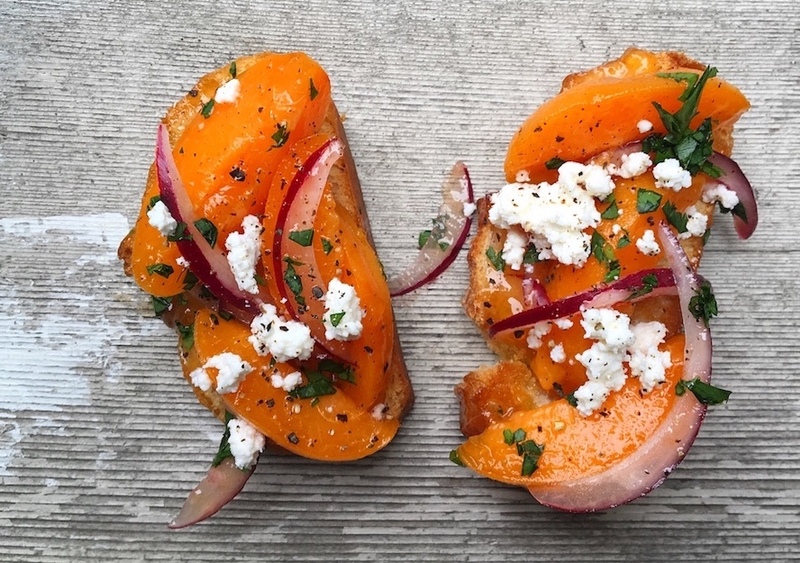 Top toasted crostini with apricot mixture and garnish with crumbled feta. Serve immediately. Makes 8 to 10.